Thanks for your interest in BDS Suspension. In addition to our website resources, we have a network of knowledgeable distributors which are able to assist with product info, sales, and technical support. Sign up for a BDS account to take advantage of 1-step checkout, save projects in your garage, order tracking, order history and other benefits. Use only letters and numbers in password. Shocks shown may differ from base kit. 1. This kit is designed to level your vehicle. 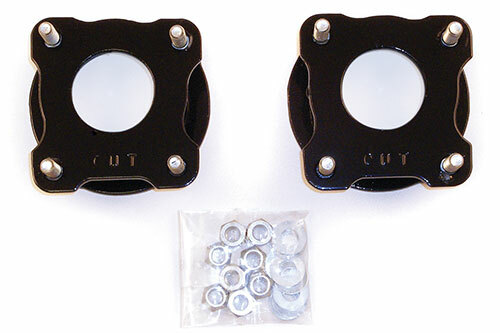 However, if you desire to maintain the stock rake there is a 1" shackle or 2" rear block kit available when you build your kit. 2. Will NOT work on TRD Pro models. * Prices shown on bds-suspension.com are MSRP and are accurate when purchased from this site. When purchased through your local dealership, actual prices may vary. All prices are shown US dollars and exclude applicable taxes and installation charges. These components are subject to change based upon your selections. These vehicles also are compatible with this product. Click on a vehicle to see other available kits. We make every effort to buy American and we hope you do as well. Buying American ensures that you are getting quality products made from quality materials. Just as important is the fact that buying American keeps your hard-earned money in the American economy. This is one of the biggest ways we as consumers can help revitalize the American economy and strengthen the US dollar. It doesn't matter whether you are buying clothing, groceries or parts for your truck…buy American and buy with confidence that your money will stay in America. BDS reserves the right to update products as necessary without notice, and will not be held responsible for misprints, or changes/variations made by vehicle manufacturers. Use of this site is subject to the Site Policies, Terms & Conditions, which constitute a legal agreement between you and BDS Suspension, Co.